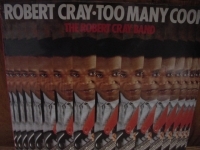 "Robert Cray, Too Many Cooks"
Classic Analog Out Of Print LP Pressing ROBERT CRAY - TOO MANY COOKS - Out of Print LP and one of the last factory sealed pieces left in the world. - Cray stirs Southern soul music and blues for his first public feast, in 1980. At this point little known outside the Pacific Northwest, he utilizes his clean, clear, and boyish tenor voice and still-developing guitar style to inhabit a thoughtfully chosen program of covers (from Willie Dixon, Howlin' Wolf, etc.) and jealous-guy originals. The contemporary blues recording debut (originally released as Who's Been Talkin' in 1980), while naturally not as strong as his later work (especially Bad Influence, released five years later), is the work of an extremely promising artist. The album is an appealing mix of standards (Willie Dixon's "Too Many Cooks," Howlin' Wolf's "Who's Been Talkin'," O.V. Wright's "I'm Gonna Forget About You," among others) and originals. Among the strongest of the latter are the slow blues "I'd Rather Be a Wino" and the closing number, "If You're Thinkin' What I'm Thinkin'," which contains the flavorful mix of tight rhythms, excellent guitar work, strong vocals, and bittersweet mood that would become Cray's hallmark. //This is an outstanding Blues LP and mymusicfix gives it our highest rating.